The Tomb: Where Jesus isn’t. This spring break, I was lucky enough to go on pilgrimage to the Holy Land with Campus Ministry. I was so excited for this trip because we were going to the place where Jesus was! Where he ate, walked, talked, died and rose. I went to the Holy Land expecting to grow in intimacy with Jesus. I certainly did, but not in the way that I expected. At the end of our trip, we had the opportunity to participate in an all-night Vigil at the Church of the Holy Sepulcher. 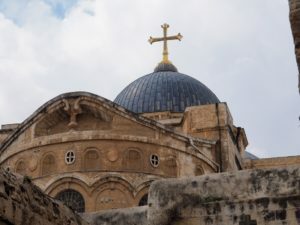 The Holy Sepulcher is the church that contains both Calvary and the stone where Jesus was laid and rose. We celebrated Mass in preparation for our vigil and the priest helping to lead our pilgrimage reminded us in his homily that at the Holy Sepulcher we would be visiting the place where Jesus isn’t. I sat there for a minute to try and really understand these words. But wait; didn’t I fly thousands of miles to be closer to Jesus? To be in the place where he was? 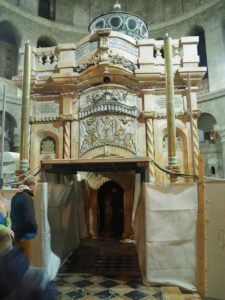 Once we arrived at the Holy Sepulcher, my friend Marissa and I decided to wait in line to see if we could enter the tomb. As we inched closer and closer to the small and low entrance to the tomb, my heart began to race as I approached the place where Jesus isn’t. We entered the small, dark space, and we were with the stone where Jesus was laid. Then I deeply understood. He isn’t here. He is alive! My heart was like fire burning within me as I was filled with the joy of the Resurrection. Seeing the empty tomb made the Resurrection even more of a reality, and my joy overflowed. I could hear the angels saying, “Why do you look for the living among the dead? He is not here, but has risen!” (Luke 24:5). I came to the Holy Land thinking that I would be moved by seeing the places that Jesus was and is. But the place that most struck me was where he isn’t: the empty tomb. Since I saw where Jesus is not, I have a desire to see where he is. Throughout my pilgrimage, I continuously saw and continue to see where Jesus is. Jesus is in the multitudes of people that passed by us in the busy streets of Jerusalem. Jesus is in my fellow pilgrims who prayed alongside me. Jesus was in every Eucharist that I ate and every Blessed Sacrament chapel that I encountered. And he is there because of the empty tomb, because of the Resurrection. I don’t have to go to the Holy Land to encounter Christ. I am already where he is: in front of the Blessed Sacrament, and among his people. At Mass, I receive the living Christ and he is alive in me. The life of each individual is witness to the Resurrection. We are to live as Christ lived: not in the tomb, but alive in him.